Also, here is a video that reviews what you should hear when taking BP, although you have to crank the volume up considerably to hear the sounds in question. Let’s talk about the gear you need to get this done, assuming you have time and funding to prep. You should be aware that using the BP cuff is not considered the gold standard of taking BP, but we will get into that in a later post. For the current purposes, it is as good as you are going to get. 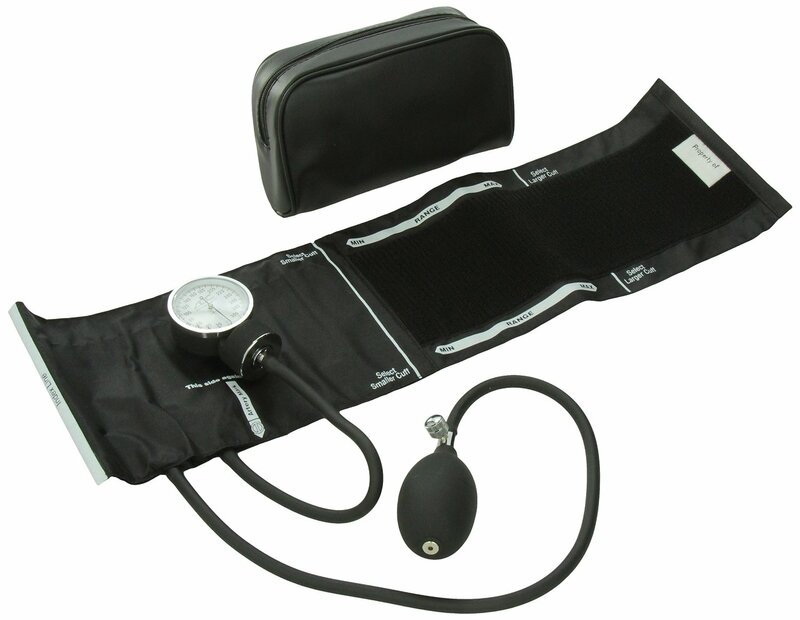 First, a blood pressure cuff, with sphygmomanometer. Avoid the digital ones. They are (or can be) accurate, but Murphy’s Law dictates they will get wet, or the batteries will die, just when you need them most. And this blog is focused on grid-down scenarios, so we won’t get fancy here. There are a bunch available on Amazon. Let’s talk about the price vs. value, and the need to have different sized cuffs to make things accurate, as mentioned in the video. This one is the #1 best seller on Amazon, and the reviews indicate it either works or it doesn’t. If you get it and it works for you, good on you. If you just want one, and you are willing to spend a bit more to get decent quality, this one is hard to beat, mostly as it is quite rugged. But the gauge is attached to the cuff; if you have folks of different sizes in your group, you will need an entire new $80 setup. This represents a significant downside for most resource-limited groups. I like this one, and MDF has a reputation of solid quality without ridiculous price. Note the 3 year warranty. This is the one I have at home. 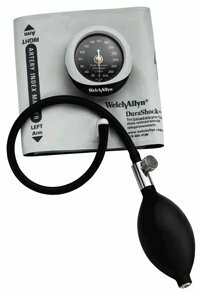 This one is a combo blood pressure cuff and stethoscope, both of very good quality, and a bit pricey. Whichever you decide to buy, you will need blood pressure cuffs that actually fit the people you anticipate taking care of. As there is no way to know what is coming in the future, I’d recommend getting at least a big-boy cuff, and a kids cuff; this should cover all the bases. Note that the links I provided are to the MDF latex-free cuffs; the one you select may have different cuffs that will fit that particular model. Now let’s talk stethoscopes. I have owned several: some very expensive Littmanns such as the Cardiology III and the electronic 3200 stethoscope. I have also put ears in the more expensive Master Cardiology and less expensive Littmann Lightweight II, as well as two different MDF models; which are the top-0f-the-line ProCardia and a less expensive Sprague-X model. I have not laid ears on MDF’s disposable Singularis DUET stethoscope; but if you have a group looking to stock up, it’s $80 for a box of 10, and they are likely sufficient to take BP and get a general feel for lung and heart sounds. Littmann makes great stethoscopes; they are the most commonly purchased among physicians. Their fit and finish is good, likely better than MDF, but frankly they do not let you hear heart sounds any better. I carry an MDF ProCardia to work every day, and think the less expensive Lightweight II and Sprague-X models are perfectly fine. I would recommend purchasing one at at least those levels of quality (Lightweight II or Sprague-X) because you will use it for more than blood pressure. I recommend against the electronic 3200 stethoscope because it (or at least mine) is optimally tuned to hear heart sounds–but lung sounds are all but inaudible. For me this was particularly awkward during my pulmonary fellowship. Should you be into cardiology, however, this is a great, albeit expensive, piece of kit. Also, I recommend against it, for the same reason I recommend against electronic BP monitors–Murphy’s law states the battery will always fail, right when you need it. And if it gets wet, you are plum out o’ luck. Assignment #1: the obvious one: get yo’self the kit, and check blood pressures on both arms, on as many people as you can. Check your own blood pressure 4 times a day for a day or two; first thing in the morning and right before bed are important–it gives a feel for the natural variation in BP everyone has. Bonus points for attempting to check manual blood pressures on the forearm or calf. The process is the same except you pick the correct cuff for the size of the forearm, and listen over the radial artery at the wrist. You can also put the proper sized cuff on the calf, and listen over the dorsalis pedis or posterior tibial artery. There are problems with these approaches, however, the BP found in the wrist is off +/- 5 mmHg from that found in the arm. Both the wrist and ankle blood pressures are classically very difficult to hear. One tip is to start by inflating the cuff on the forearm/calf until you can no longer feel the pulse, which at least gives you some indication as to where to start. Double special extra bonus points for using the information to calculate an ankle-brachial index, which is one of the commonly used methods to detect significant peripheral vascular disease. Should you detect an abnormality, I wouldn’t freak out, but would recommend having your primary care physician check that out; the gold standard ABIs are calculated using a different technique combining doppler ultrasound and pressure cuffs, so you may be off just due to technique. Hat tip to Mr. Day for spotting the incorrect link on the first video. Fixed and revamped post. Double bonus points! Nay! TRIPLE! BP is a skill you need to do a LOT of repetitions on to get comfortable that you can get it right. BUT you want to be making the habit of doing it right when you CAN so that it’s virtually automatic. AND you want to be able to get it right even when you can’t set things up ideally. Ideally you will have your pt sitting back against a back rest, and you will be supporting the arm you are using at about heart level. That is important. Arm above or below heart level can change BP by 10 mmHg per inch above or below. Accidentally weighting the BP 10 points either way can be an issue, MOSTLY because what you are looking for is the TREND, particularly when dealing with injury or illness. (In some of the bigger shops, Cleveland Clinic for example) your doc can tap a button on your chart and see the graph of your past appointments so he can assess the trend. I made a comment on habit and doing it the same way every time. There will be days when you can’t do that. BUT at least try to do it the same way each time for that particular patient and situation, so you can get a valid trend assessment. If you’re dealing with an injury or illness, and the pressure is dropping, you are headed into shock (or already there) and you might want to intervene to stop that trend. If it is RISING you aren’t pickin in tall cotton, since that can indicate a head injury or other brain function issues. Maybe Doc or Mike or some of our other folks can knock together a quick and dirty cheat sheet on rising and falling BP, expanding or shrinking pulse pressure (difference between Systolic (top) and Diastolic (bottom) number) and how not to be fooled in a patient with an extremely high BP that awkwardly doesn’t look nearly as high as it is. (pesky http://en.wikipedia.org/wiki/Auscultatory_gap ). It can get the best of us and is one of the reason we work on technique so much. I find it interesting that the technique has apparently changed again in that they didn’t palpate (feel) the radial pulse as they pumped up the cuff. This has been going into and out of style for years. I’m partial to doing it if I have access to the wrist and a free finger. Upside down under the car in the snow, of course I’m not doin it. Now would be a good place to mention, that if in reading ANY of us writers/commenters stuff, if we use a term you aren’t familiar with you can C&P it and google it or ask us. FERGAWDSAKE(!!!) don’t just read past it and not figure it out. Some of it is damned important! We who have lived with the lingo for years THINK in it and if you aren’t used to it you need to ask. Yes it’s jargon but it’s a lot easier to use than the prose definitions…Trust me. Oh crap. There isn’t an edit button!! Had an abnormal BP at DR’s office on Thurs-my BP has always been within 5 of 120/80,on Thurs,with nurse using one of the digital “things” where I hold my arm on my chest,my supposed BP was 149/103. Nurse told DR,then asked me some questions,then Dr. said it’s probably the “thing” has low batteries,or needs tossed in trash can. Nurse then just said we’ll call it a questionable reading,and left it at that. The numbers sorta freaked me out,so I asked my sister,who’s an RN if she could take my BP-she did,and it was 126/83. Is there anything that could cause a person with “normal” BP to have a BP that far off of normal,that would go away,and show a normal reading 3 hours later? Lots of reasons for variation in BP readings. 2. 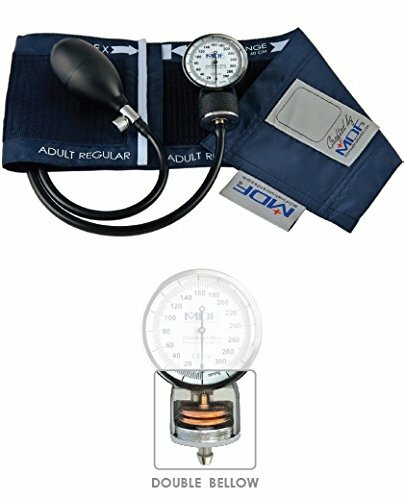 Taking BP via traditional, BP cuff with stethoscope vs automated devices–they use two different methods. Automated devices use the “oscillatory” mechanism that depends on a computer algorithm, which needs to be calibrated. I believe the white coat hypertension can be ruled out,as in that same office,with the same nurse taking my BP-it’s always been 120-125/80-85. My sister took my BP Thurs,Fri,and yesterday afternoon,it was in the same range it always is. She used the cuff and stethoscope method. Thanks for the info,as I said that reading kind of freaked me out because it was so far from normal range. As a rule of thumb, in an ideal situation with an otherwise “healthy” pt, I always double check odd BPs using a cuff and stethoscope. Sometimes the machines are off. We use them at work quite often but if the pt moves, if the machine is off, if the pt has a condition such as A-Fib, then the reading can be drastically off. Theoretically the machines are better than my own eyes and ears, but when something seems off I trust my eyes and ears (and sometimes my gut). I am surprised the nurse or the Doc at the Doc’s office did not take a manual BP when she got a reading so high and so abnormal for you. I think that after nurse asked Dr. they must have been having issues with that machine-because I asked about it at next appt,and it was entered in my chart as probable machine malfunction/pt had normal pulse,no other signs of any abnormality-plus that machine was gone,and she-different nurse from 1st appt, had a brand new one-I asked,and the old one had been tossed. It’s been too long ago now-I can’t remember what questions the nurse asked me-but I must have answered in a way to ease any doubts about these being anything seriously wrong. Were you sitting forward or leaning back against a back rest on any of these occasions? No,sitting up on exam table. I asked at my next appt-(last week)-it was the machine-they have a brand new one now.